“A mistake” is how Berrien County Sheriff Paul Bailey characterizes his use of his county email in an exchange with a staffer for the Senate campaign of Kim LaSata last fall. Bailey made that comment to MIRS News after WSJM News obtained over 1,100 of his emails from October 2018 through a Freedom of Information Act request. The FOIA request was made in search of emails MIRS has obtained that were sent from the county email account of Judge Charlie LaSata, allegedly campaigning for his wife. Of the emails we’ve obtained, just six were sent from Bailey’s county email account regarding the campaign. All were related to an endorsement letter to the editor to be sent to the “Herald-Palladium” with his name attached, written by the campaign staff. 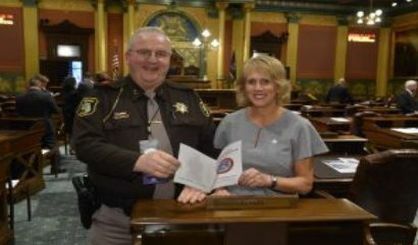 The exchange was initiated by a campaign staffer, not Sheriff Bailey, and the sheriff receiving the emails is not a violation of the Michigan Campaign Finance Act. Responding to them using the county email account, however, is another issue. In those six emails, Bailey wrote just 14 words, agreeing to sign on to the endorsement and asking to have it sent to the newspaper. The FOIA request by WSJM News was made of the sheriff’s emails because a previous request seeking Judge LaSata’s emails was declined due to the judicial branch not being subject to open records laws. Senator LaSata brushed off the reporting by WSJM and MIRS over the past several weeks as “fake news” as she rushed into the annual legislative forum held by the Area Agency on Aging in St. Joseph on Friday, for which she was nearly a half-hour late.